During the last several decades sports complexes around the world have become beautiful recreation centers with a variety of cutting-edge features and special amenities. Gone are the days of boxy, single-use sports facilities – today’s buildings are impressive architectural statements that reflect the needs and wants of the public and athletes. Designed to combine “exercise with sociability”, modern sports complexes can house multiple different activities and provide superb safety, comfort, and enjoyment to both players and spectators. 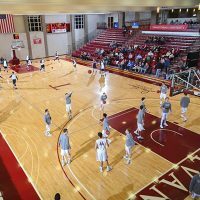 Basketball sports facilities make no exception – the rules and requirements of the game have not changed much over time, but basketball court design has evolved to meet the demands and expectations of present-day society. The contemporary trends of greater flexibility, increased safety and comfort, smaller carbon footprint, higher aesthetic appeal, and state-of-the-art technological implementations are all present in modern basketball sports complex design. So, when constructing a new basketball sports center or renovating an existing one, facility owners should keep pace and create green, high-performing, multipurpose athletic complexes with eye-catching artistry and emphasis on spectator experience. As is the case with many other aspects of modern life, concern about environmental impact is an important factor in sports facility design. 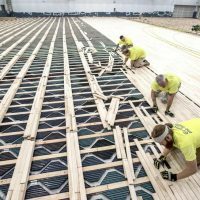 Greener athletic complexes are emerging as a growing national trend, both because of the positive public image of ecologically responsible businesses and the cost-effectiveness of green construction methods and materials. Water-based finishes with low VOC emission. Greener sports facilitates not only have a smaller impact on the environment, but are also much more energy-efficient and easier to maintain than older sports complexes. This results in saved money and improved comfort levels, thus benefiting both the facility owners and facility users. Modern sports facilities are designed with flexibility and multipurpose use in mind. 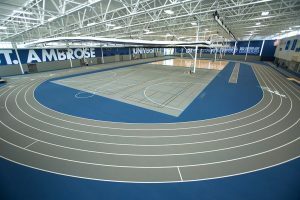 They provide an appropriate environment for various athletic activities and serve as lively community centers – in addition to the main courts, a contemporary athletic complex usually incorporates fitness lofts, dancing studios, group exercise rooms, saunas, bars, and various other state-of-the-art recreational amenities. It’s an ideal venue for parties, dance events, yoga classes, track meets, corporate competitions, and many other social activities. portable scoreboards with wireless controllers; etc. What’s more, gym curtains and dividers provide modern sports facilities with the ability to host multiple events and tournaments at the same time (dividing a professional sized basketball court also allows for junior league practices and games). Needless to say, multiplying the uses of a large sports complex increases its functionality and profitability. Gyms and other indoor sports centers in the past were usually reduced to big, cement-looking cubes with exposed ceilings, no (or very few) windows, and amber wood floors with painted lines in primary colors. Not only is this design uninventive and unattractive, but it is also not energy efficient and environmentally unsound. Nowadays, the boring, boxy look of sports facilities is replaced by spectacular facades and creative building designs. The athletic centers look integrated with the natural and built environment that surrounds them, and they have a lot of artistic flair and varying color themes. 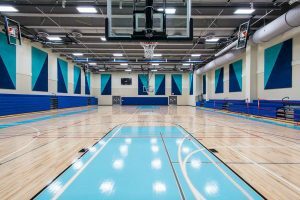 The trend for more color in sports complexes is quite evident in basketball facilities – professional sports teams have long been adding logos to their courts, but basketball teams have recently pushed the boundaries of color to make bold artistic statements. 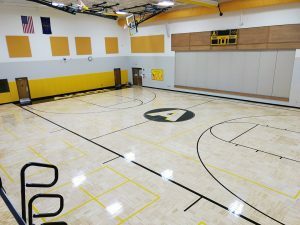 Contemporary basketball sports flooring comes in an array of hues and styles, with complex patterns and dimensional effects that add plenty of visual interest to the space. Manufacturers can even create custom color mixtures to match club or corporate colors and have the names, logos, and mascots of teams, sponsors, and advertisers printed on the flooring. More and more sports complexes across the country are incorporating elements from their state flags onto the court to add dramatic emphasis. Others create themed floors or visual highlights that catch the eye and focus the interest of the spectators. The innovative design and extravagant color themes appeal to the public and draw greater attendance. 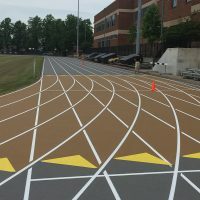 Apart from providing a safe, comfortable, and stimulating environment for indoor sports activities, athletic facility designers and owners are also aiming to satisfy spectators’ hunger for an enjoyable experience. People’s expectations of what a sports complex should offer have grown considerably over the years – now fans request not only a spectacular view and genuine sporting experience, but also a comfortable environment and various recreational and socializing opportunities. It is, therefore, necessary for sports facilities these days to plan for ample parking and comfortable seating, a variety of special amenities, and plenty of cutting-edge features. Bowl seating design has taken hold, aiming at increasing the c-value (the spectators’ line of sight) and enhancing sightlines from each and every seat in a sports complex. New modular bleachers have wider aisles and larger decks for safety purposes and offer higher patron comfort and aesthetic appeal. They are easy to clean and maintain and can be designed in such a way that a team’s mascot or sponsor’s name appear when they’re retracted, so the bank of bleachers turns into signage instead of a boring slab of gray. What’s more, many larger basketball complexes are removing seating to make way for more promenades, bars, and social areas within the facility. Sports facility design today is also influenced by compliance issues, safety and liability concerns, and economic realities. Yet, greener, multi-purpose courts with higher artistic appeal and spectator comfort are the biggest contemporary trends in basketball complex design. 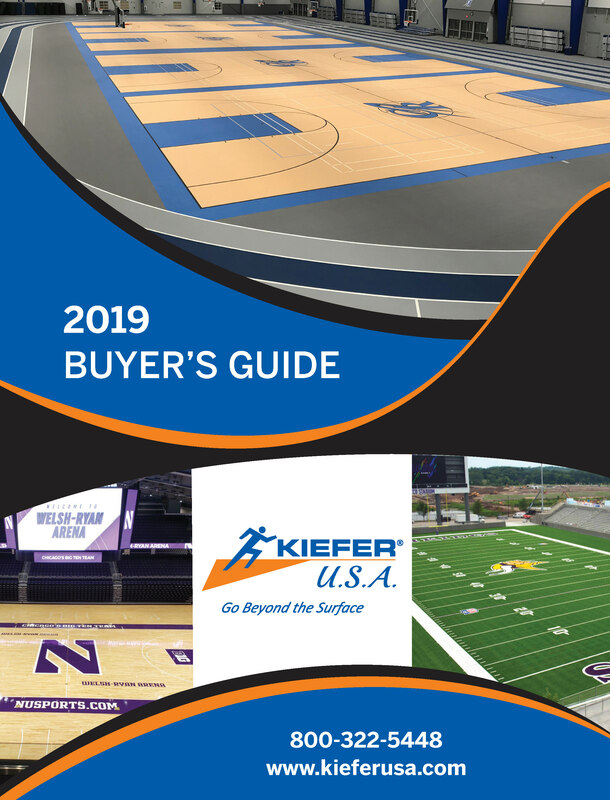 If you’re interested in building or renovating a basketball facility, you can count on KieferUSA for professional assistance – we have rich experience in the field and can offer detailed information, useful tips, and efficient flooring solutions to help you create a beautiful, high-performing, eco-friendly sports center. All you need to do is give us a call at 800-322-5448 – our experts will guide you through the entire process – from design to installation. Your project will be a guaranteed success. Sports facilities make no exception – floodwaters can be devastating to school gymnasiums, field houses, athletic arenas, and other sports centers. Even a relatively small amount of water from broken pipes, malfunctioning sprinklers, or leaky roofs can cause severe water damage to a sports floor, but flooding is sure to warrant extensive repairs or replacement. 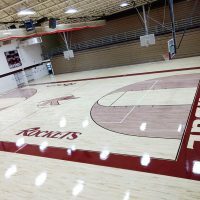 So, what should school administrators and facility owners do if their sports floors get flooded? How can they get their facilities back up and running shortly after the disaster? 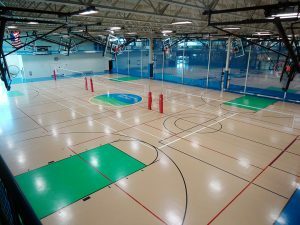 Kiefer USA was more than happy to assist the University of Illinois in Urbana-Champaign with installing new sports flooring in their Recreation Centers during the summer. One of the most effective ways to prevent sports injuries is to ensure that athletes are playing on the right type of sports flooring and surfaces both indoors and outdoors. Sports flooring types are made with special care to provide shock absorption as well as a suitable surface for each sport. The following is a complete guide on the different types of sports flooring used for indoor and outdoor applications. Hononegah High School is ready to show off their new fieldhouse! What Qualities Make a Gym Great?